This Burgess: Song Review: D.J. Jazzy Jeff and The Fresh Prince - "I Think I Can Beat Mike Tyson"
Song Review: D.J. Jazzy Jeff and The Fresh Prince - "I Think I Can Beat Mike Tyson"
D.J. 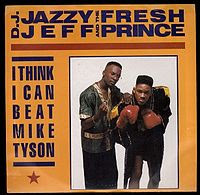 Jazzy Jeff and The Fresh Prince's summer jam of 1989, "I Think I Can Beat Mike Tyson", represents true artists at work. A long way from singing along with a Phil Collins record in The Hangover, Mike Tyson was on top of his game in the final year of the 80's. That year he was undefeated after administering TKOs to opponents Frank Bruno and Carl Williams. In this song, the Fresh Prince decides to pick a fight with Tyson BECAUSE he is the fiercest. The plot of the song's story arc has him on the receiving end of multiple knuckle sandwiches. After watching several tapes of the unbeaten, and seemingly invincible heavyweight boxing champion Mike Tyson, Fresh Prince (Will Smith) gets the strange idea that he has managed to find a way to defeat the champ, and manages to convince Don King to arrange a match in two months and DJ Jazzy Jeff to train him. No one gives Fresh Prince any chance – reporters covering his camp are booing (compounded by Fresh Prince's unrealistic brags, such as performing 4 million situps in a minute and throwing a Volkswagen half a city block), his barber thinks he can beat him, but only if he used a baseball bat (and asks if he can have his shoes once Tyson kills him), and Fresh Prince even hears his own grandmother bet $1,000 against him. As predicted, the fight doesn't go well, and Prince manages to avoid being punched for a second, only to get hit in the body (at which point, he says to be discreet, "let's just say that my bowels released"). He stumbles back to his corner, who insist he continue fighting, so he hits DJ Jazzy Jeff and the fight ends. At the end of the video, DJ Jazzy Jeff thinks that, by watching both the Tyson tapes and Fresh Prince in training, that now he could beat Tyson, only to have Fresh Prince say "no one can beat him" and abruptly end the song. Interspersed in the song is a conversation between two older men, Leroy and another unnamed man. The unnamed man claims to have attended a Tyson fight and saw Tyson's opponent's head fly "into the 18th row" while Leroy thinks Tyson is a football player from Montreal (in an extended version of the song, Leroy replies that the other man hadn't been "off the block in 18 years"). Three guest stars appear in the accompanying music video. Mike Tyson himself shows up as The Fresh Prince's opponent. Don King also appears in the video, and Alfonso Ribeiro (future co-star of The Fresh Prince of Bel-Air) appears as a member of the fighting crew's posse. The Lonely Island pay homage to this track on their just-released disc, Turtleneck and Chain, with their song "Rocky". In this version, though, there is no next time. The protagonist is stomped out of existence. Will Smith's very real desire to achieve ultimate fame, success and wealth is what makes his instant reaction to seeing Tyson's skills as a direct threat to his own so believable. The concept is made that much more palpable as he is shown as being somewhat humbled by the reality of actually fighting Tyson. The end of the song does end with him saying that no one can beat Tyson, yet Jazzy Jeff has just decided that he himself could take the Heavyweight champion of the world. No one really believes that this is the last time these two will challenge a title holder.